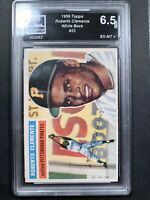 1956 Topps MICKEY MANTLE Gray Back #135 PSA Graded 3 VG- Cond "NO CREASE HI-END"
1956 Topps #33 Roberto Clemente graded 6.5 - Check Out The Pics! PSA 7 Or 8??? ?